I love brisket. My number one favorite food is (and always has been) corned beef, but very close behind it is brisket. I know, they're the same thing, just prepared different. So when Alex came home with a brisket, I was a happy girl. Falling apart tender brisket, caramelized vegetables roasted in the pan with the meat, and smooth dark gravy. Mmmm. I guess I'll post this today since we'll be eating leftovers for a few more days, but maybe later after I clean the house I'll make something. Who knows. Preheat oven to 325 degrees. Heat the fat or oil in a large pan. Rub the brisket with salt and pepper, and sear for about 5 minutes on each side until a nice crust forms. 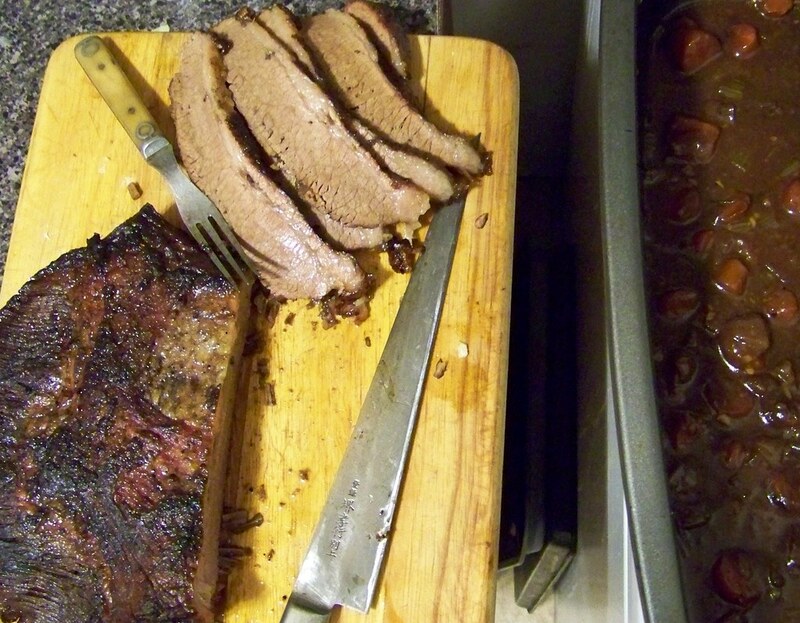 Spread all the vegetables in a large roaster pan, and place the brisket on top. Pour in the liquid, cover with foil, and stick the pan in the oven. Every hour or so, baste the meat. Let it cook 3-4 hours until very tender. Strain the pan juices, and try to get most of the fat off the top (using a gravy separator). Heat 2 T fat or butter in a pan until melted, and whisk in 2 T rice flour and cook 1 minute. Whisk in the reserved juices from the pan, and enough stock or wine to make 2 cups liquid total. Heat until thickened, taste for salt and pepper. Alternately, put your roaster pan (minus the brisket, with the vegetables) onto two burners on the stove and bring to a simmer. Stir in another cup or two of liquid, stock or wine or water. Whisk in 2 T rice flour, and keep simmering while whisking. In a minute or two it will thicken up, then take it off the heat and serve. Jeanine - It is! Thanks!